Since the mid-1990's, during spring migration, Snow Geese have been favoring the Middle Creek Wildlife Management Area, located on the Lebanon-Lancaster County line in Pennsylvania, as their gathering ground before their long trip to their Arctic breeding grounds. This year their numbers are estimated to peak at well over 100,000. It is truly amazing to see so many geese fly together. Here's another photo. The Snow Goose is a North American species of goose that breeds in the Arctic tundra. It spends half the year migrating between warmer wintering areas and breeding grounds, typically covering over 3000 miles in each direction. 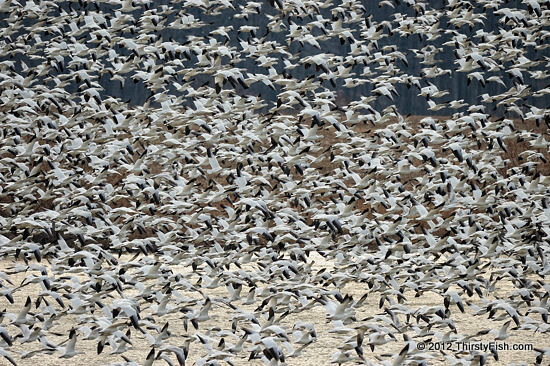 In the beginning of 20th Century, the Snow Geese population was declining to dangerously low levels. These days, their populations have reached a peak, and they are spreading to previously untouched sections of the Hudson Bay coastline.